The cold, rainy days of January are perfect weather for hunkering down inside and cooking dishes that chase away winter’s chill. Tucked in my warm kitchen as the wind howls outside, I grab my dutch oven, blast a favorite playlist on Spotify, and find my groove making a batch of beef chili. When I get a hankering for a chili fix, I reach for this bean-free, low carb recipe again and again. There are two camps with firm beliefs about the “right” way to make chili. Purists adamantly oppose adding beans, while others can’t imagine chili without them! History would seem to support their position. A bit of foodie trivia: the spicy meat stew we know today actually originated in South American Mexican tradition where ‘chili’ is short for ‘chili con carne,’ or chilies with meat. This flavorful, protein rich version stars grass fed and finished ground beef from local Stemple Creek Ranch, blended with fire roasted tomatoes, and spiked with jalapeños and smokey Chipotle peppers. The recipe is mildly spicy, so if you love heat I recommend adding additional spices midway through cooking. 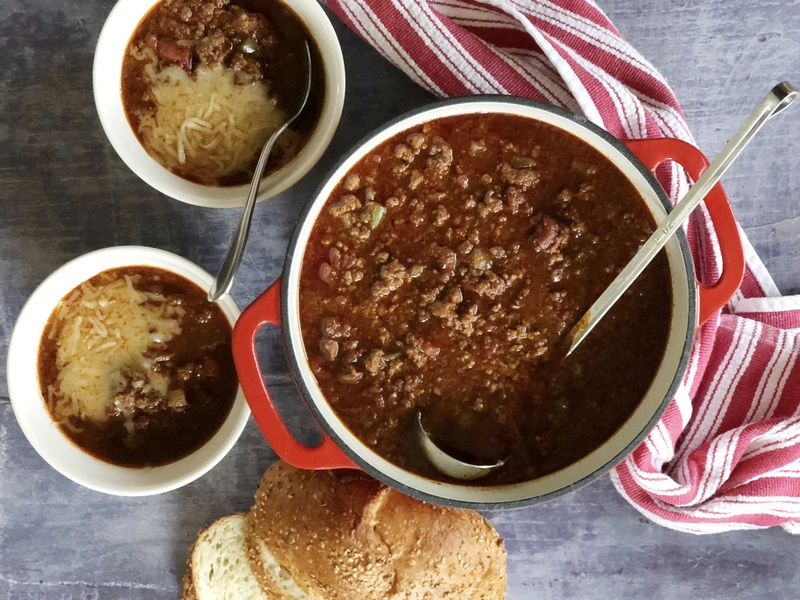 Whether you whip up a batch for family and friends, or bring it to a Super Bowl party, this chili is sure to be a huge hit! optional (depending on how much spice you like): crushed red pepper flakes, cayenne pepper. In a large pot, brown the ground beef until no longer pink. Remove heat and strain cooked beef over a bowl. Discard extra fat. Return pot to stove and add olive oil. When the oil is hot, add chopped onion, peppers and garlic. Sauté over medium heat until veggies soften and are just starting to brown. Return cooked beef to the pot. 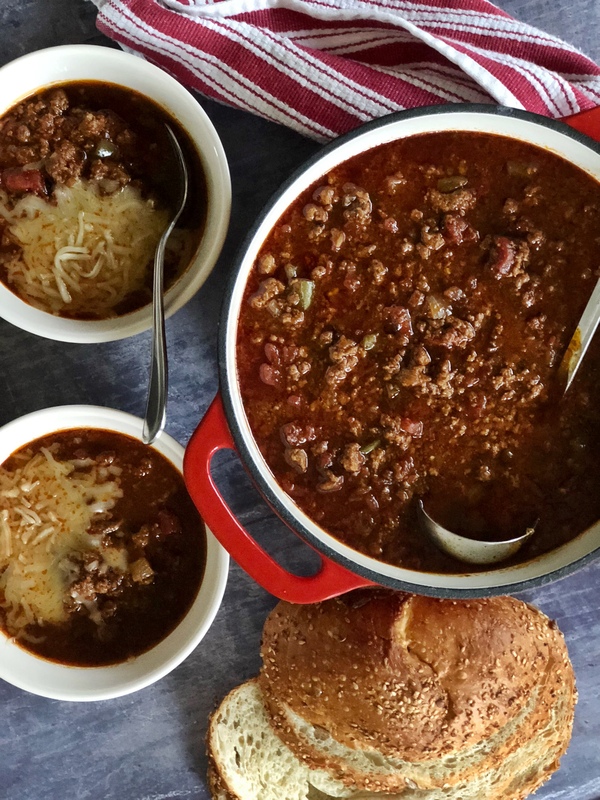 Bring chili to a low simmer. Cover and cook two hours, stirring occasionally. *Taste after one hour and adjust seasonings. Serve in bowls topped with your choice of shredded cheese, sour cream, avocado, sliced green onion–whatever you like! My kind of chili. Looks like a delicious recipe.